The 2018 Economic and Community Impact Report highlights the many ways in which The University of Scranton contributes to the vitality of the region. Student, faculty and staff voluntary service, community-based learning projects imbedded in academic courses, job creation, academic competitions for local students, free concerts and lectures, athletic competitions and investment in campus improvements are among the numerous ways in which The University of Scranton impacts the region. These ways and others are highlighted in the 2018 Economic and Community Impact Report, published in January by the University’s Office of Community and Government Relations. According to the report, more than 100 community-based learning classes were conducted at the University during the 2017-2018 academic year alone. The community-related service project components imbedded in academic courses resulted in more than 2,400 students engaging in more than 33,000 hours of service. More than 60 faculty from 16 different academic departments engaged students in these courses in a variety of activities related to their academic study and in collaboration with community partners, which included United Neighborhood Centers of Northeastern Pennsylvania, Allied Services, St. Joseph’s Center, Neighborworks Northeastern Pennsylvania, and Friends of the Poor, among others. In addition to the community-based academic learning service projects that are part of a course, student volunteers assisted community agencies and participated in special projects. Service projects included those completed by members of the University’s 85 student clubs which are required to complete at least three service events each academic year. Altogether, more than 3,500 students contributed a total of 170,000 hours of service, much of it in Northeastern Pennsylvania. The report also highlighted some of the services provided by the University’s Leahy Clinic for the Uninsured, which served 1,023 patients, dispensed 538 prescriptions, and provided 111 immunizations in 2017. In addition to student volunteer service, 84 percent of staff and 81 percent of faculty at Scranton reported being engaged in community volunteer activities in a recent survey. The report also highlights some of the other ways the University enriches the region, such as offering more than 100 free events annually that are open to the public, including exhibits and artist lectures at the Hope Horn Gallery, Performance Music concerts and masterclasses featuring University students and renowned guest artists, as well as a variety of public lectures and athletic events. 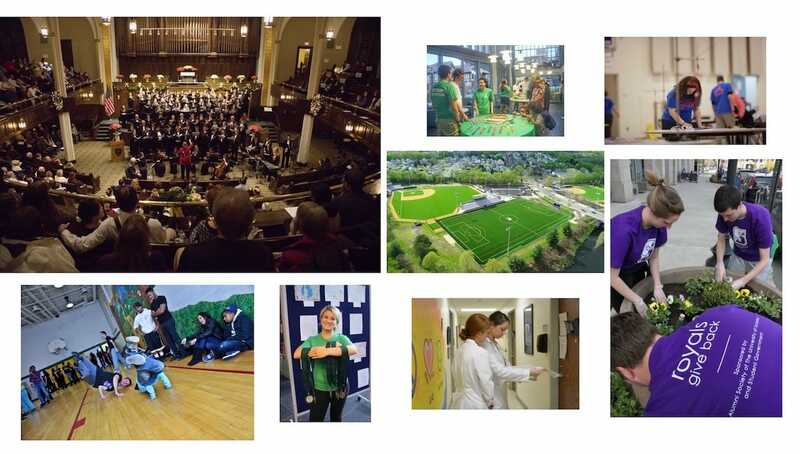 In the 2017-2018 academic year, 403 high school students also participated in academic competitions and activities offered at the University and another 360 elementary, middle and high school students were served through after-school and mentoring programs as well as a special Scranton School District Community Partnership program. In addition, the University’s Small Business Development Center provide 908 consulting hours to 139 clients in the City of Scranton in 2017 for a total of more than 12,000 hours in the past 38 years. The report showed the University’s overall economic impact on Northeastern Pennsylvania at a total of $319.6 million, according to a study conducted by the Institute for Public Policy and Economic Development in 2018, which is based on data from the 2016-2017 academic year. University’s expenditures in goods and services were $142,282,831 and its total value added was $152,060,712. In addition, operations generated over $24.2 million in federal taxes and over $12.8 million in state and local taxes. This is in addition to the University student spending, which averages $1.2 million off-campus spending each month, according to a 2017 survey of students. Although the University meets or exceeds all of requirements for tax exemption in the Commonwealth of Pennsylvania, the University has been the most consistent nonprofit in the City to provide an unrestricted, voluntary contribution to the City. In 2017, the University increased and targeted its annual contribution to $200,000 to the City of Scranton, with $150,000 aimed at downtown revitalization efforts by Scranton Tomorrow and $50,000 targeted for public safety. Since 1983, the University’s contribution to the City has totaled more than $3.6 million and over $1.5 million to Lackawanna County. The report also noted that the University pays property tax in cases where the property has not yet been converted to educational use. In the 2017-2018 academic year, the University paid property taxes totaling $300,396 to the City of Scranton, Scranton School District, Lackawanna County and other municipalities. In addition, the University’s business partners (e.g. ARAMARK and Follett) pay various taxes, including a $30,065.21 mercantile tax paid to the City & School District. The University’s 2018 Economic and Community Impact Report can be seen on the Community Relations webpage.